We're going to a surprise party today for a friend who is celebrating her 40th birthday. The invitation insists on cards only, so in my book that means it's a golden opportunity to give one that's handmade. Usually the postal service does a pretty good job of getting my cards to their destinations intact, but it's really nice to not have to think about bubble wrap envelopes every now and then. I searched through my card stash and decided on this one - it makes me think of spring and is sweet and feminine, just like the birthday girl. 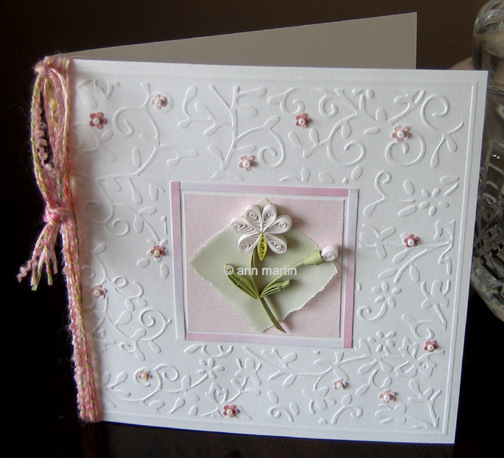 The embossed card blank is by Die Cuts With A View. I made the card for an in-depth article called Quill It Easy - Add a New Twist to Card Making that I wrote for the March 2008 issue of CardMaker Magazine. Just recently, subscribers to CardMaker have been given the option of a digital subscription [edit: no longer available]. The beauty of it is that you are given instant access, not only to the current issue, but also to two years of easily searchable back issues. Just think, if you like to make your own cards, you could print out the article right away, and get started making this one today. It´s wonderful to have you and all your work closer to us. Congratulations for the card, for the magazine article and for the blog. Have a great Woman´s Day!! Thank you, Regina - that's so kind of you. I'm very fond of your work also. Congratulations on being published - and that card is beautiful!